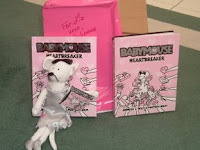 Many thanks to Jennifer L. Holm & Matthew Holm; and the lovely copy of Babymouse: Heartbreaker, along with a copy for MPOW, along with a Babymouse doll that Cheetah will adore. 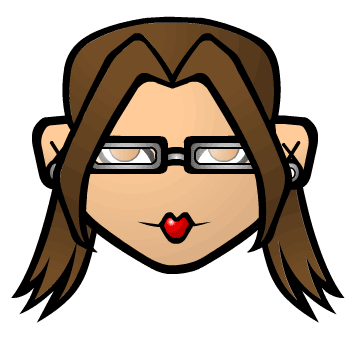 Are you sure you're going to be able to part with the Babymouse doll? Very nice. 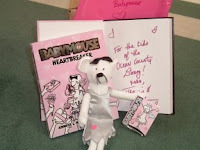 The Babymouse Doll: Based on past experience, it goes on my shelf. At some point she approaches with asking about the toy (Jane Austen action figure, Buffy Beany Baby, or, now, Babymouse) and asks "Is that yours?" with a look that clearly says both "you are way too old to be selfish about your toys, set an example and share" and "I'm so cute, how can you say no?" The best I'll be able to do is to perhaps convince her that Babymouse stays in my house so it's always here for her to play with.